Opera View information about your version of Opera, access preferences, sign in to your Opera account, clear browsing data, import browsing data, get themes and extensions, or quit the browser. File Manage tabs or windows, open files and locations, save pages locally, or print. Edit Manipulate text (copy, paste, or select), search for text in pages, or check spelling. View Zoom, show or hide the bookmark bar or the extensions sidebar, toggle presentation mode, browse in full screen, access start page items (Speed Dial or news), view downloads, manage extensions or themes, open the password manager, or toggle developer tools. History Navigate back or forward, reopen closed tabs or windows, navigate to recently-viewed pages, or view your full browsing history. Bookmarks Open the bookmark manager, bookmark the current page, or navigate to pages in your bookmark folders. Window Minimize the current window, zoom, or select open windows and tabs. Help Access Opera help pages, view keyboard shortcuts, or report issues. For Windows and Linux users, the main menu offers ways of interacting with the browser. You can open new tabs or browser windows, zoom pages, or view Opera pages such as Speed Dial, news, bookmarks, downloads, history, or settings. (2) The tab bar navigates between pages when you view more than one at a time. Click a page’s tab to view its contents. To open a new tab, click the + button on the tab bar. (4) The combined address and search bar directs the browser to websites and searches the web. 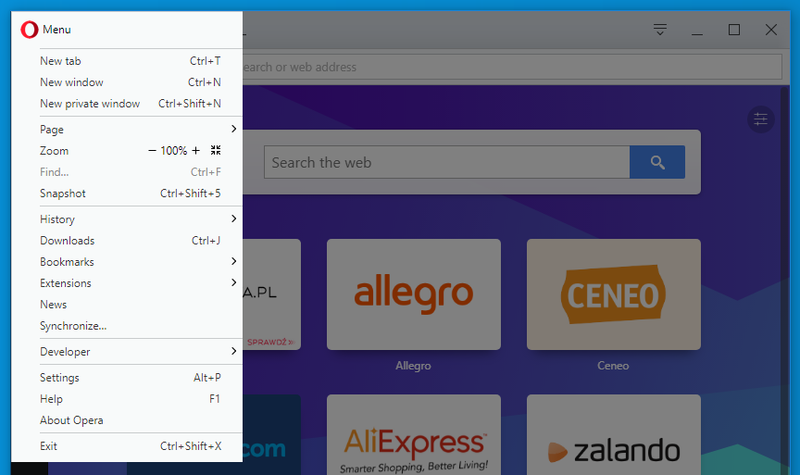 You can type website addresses, for example https://www.opera.com/, or search the web with key words, for example ‘Opera browser’. Read more about the combined address and search bar. (5) The web view shows the content of a page. Here you can interact with web pages by reading text, viewing pictures, clicking links, and more. Opera’s sidebar, found in the start page, is your quick access to messengers, Speed Dial, snapshot, My Flow, bookmarks, personal news, tabs, history, extensions, downloads, and preferences. The sidebar is always present in the start page, but you can pin it to your browser to make it readily available when browsing other pages. To pin the sidebar to Opera, go to the start page and click the Pin sidebar button at the bottom of the sidebar. Click the button again to unpin the sidebar. Unpinning the sidebar will make the sidebar only available from the start page. You can customize which pages, online messengers, and features will be visible in your sidebar. To customize your sidebar, Ctrl+click (Mac) or right-click (Win/Lin) the sidebar and select the features you wish to be visible. You can access the sidebar settings from Settings > Sidebar. Here you can select to pin sidebar, enable a narrow sidebar, or enable messenger notification badges. Opera can organize multiple pages into one browsing window using tabs, which are designed to resemble paper filing tabs. Tabs allow you to interact with many pages simultaneously without closing a page until you are ready. To open a new tab, click the + button on the tab bar. You can optionally hover your mouse over a tab to preview its contents without changing focus from the current page. Previewing tabs is helpful if you have several open at one time. Under User interface, turn on Show tab previews. To close a tab, hover your mouse over the tab and click the x button. To close all tabs except your current tab, Ctrl+click (Mac) or right-click (Win/Lin) the current tab and select Close other tabs. You can also close all tabs to the right of your current tab with Close tabs to the right. If you’ve accidentally closed a tab or want to reactivate the most recently closed tab, Ctrl+click (Mac) or right-click (Win/Lin) a tab and select Reopen last closed tab. You can prevent Opera from closing tabs accidentally or prioritize important pages by pinning tabs. A pinned tab does not close, and will remain pinned when restarting the browser. To pin or unpin a tab to the tab bar, Ctrl+click (Mac) or right-click (Win/Lin) the tab and select Pin Tab/Unpin Tab. When pinned, the tab will move to the left side of the tabs bar. If you’d like an open tab to be placed in a separate window, simply drag and drop the tab off the tab bar. Tabs can also be dragged and dropped between open windows. To open a copy of a page in a new tab, Ctrl+click (Mac) or right-click (Win/Lin) the tab and select Duplicate tab. You can save all open tabs in a window as a folder of Speed Dial entries. Ctrl+click (Mac) or right-click (Win/Lin) the tab bar, or on any tab, and select Save all tabs as Speed Dial folder. A new, untitled folder will be placed at the bottom of your Speed Dial. ⌘-click (Mac) or Ctrl-click (Win/Lin) the tabs you wish to save. Ctrl-click (Mac) or right-click (Win/Lin) one of the selected tabs to open the context menu. Click Save tabs as a Speed Dial folder in the context menu. If you like to have a large number of tabs open, the tab menu can help you better manage and open the tabs you’re looking for. The tab menu appears on the right side of the tab bar. Click the tab menu to see a list of recently closed tabs and open tabs from all your synced devices. You can interact with the tab menu using your keyboard. Press Ctrl+M to open or close the tab menu. Use the arrow keys to navigate the tab list. Press Enter to open an entry from the list. To make the most of the tab menu, you may wish to enable tab previews. Each tab will retain its browsing history until it is closed. To view the history of a tab, click and hold the back or forward button on the left side of the combined address and search bar. Continue holding the click as you move to select a former page from the list, and release to open the page. Context menus appear when you Ctrl+click (Mac) or right-click (Win/Lin) a part of a web page. A different menu will appear depending on the element type: page, link, or image. The page context menu appears when you Ctrl+click (Mac) or right-click (Win/Lin) a part of a web page where there are no links, images, or text. This menu provides you with navigation options (go back, forward or reload the page), options for saving the page as a Speed Dial entry or bookmark, viewing the source code of the page, saving the page as a PDF file, and more. The link context menu appears when you Ctrl+click (Mac) or right-click (Win/Lin) a link and lets you decide how to open or save the linked page or address. The image context menu appears when you Ctrl+click (Mac) or right-click (Win/Lin) an image and contains multiple options for opening, copying, and saving the image. Opera’s zooming functionality allows you to read small fonts more easily. To zoom when using a Mac, select View > Zoom In/Zoom Out. For Windows or Linux users, go to the O Menu > Zoom. You can also use keyboard shortcuts to zoom in and out with Ctrl or ⌘ + +/-. Under Appearance, click the Page zoom dropdown menu. Select the level of zoom for all web pages. After you set the page zoom, pages will zoom to the adjusted default size when you open them. If you have tabs already open, reload them to view the page at your new default size. For Mac users, if you wish to return an individual page to its original format, click View > Actual Size. Windows and Linux users can go to the O Menu > Zoom and select Reset zoom to the right of +. Opera gives you the option to browse in full screen and presentation modes. Full screen mode hides the menu bar from view but keeps your tab bar and the combined address and search bar visible. To turn full screen mode on or off on Mac, go to View > Enter/Exit Full Screen. Windows and Linux users can go to the O Menu > Page and select Full screen. Presentation mode, available only for Mac users, will hide all menus and toolbars, allowing the page to fill the entire screen. This is particularly useful when projecting your screen onto another. Go to View > Enter/Exit Presentation Mode to turn off presentation mode. For Mac users, in either of these modes, you can access your menu bar by hovering your mouse at the top of your screen. On all platforms, full screen and presentation modes can be exited by pressing Esc. Opera can search through the text on a page and find text for you. To find text on a page, press Ctrl+F or ⌘+F on your keyboard. Type in the search field to find your text. Found words are highlighted in green as you search. If more than one instance of the word exists on the page, they will be highlighted in yellow and a count will appear in the search field. To navigate between instances, click the left and right arrows. When you download a file from a website, a download message appears below the right side of the combined address and search bar. This message shows a progress bar of the download, and disappears when the download is complete. A new icon appears at the right side of the combined address and search bar, too. Click this to see a list of your most recently downloaded files, or clear them from your download history. To view a detailed list of your downloaded files, launch the files from the browser, or restart a download if your connection was interrupted, select View > Downloads on Mac. On Windows and Linux, go to O Menu > Downloads. Under Downloads, click the Change button. Navigate to the folder you wish to have downloads saved to and click Select. Here, you can also set the browser to ask you where you’d like to save files every time you download.